This small park is found off of Ragsdale Road, which is located just of off Highway 92. It is just opposite Cauble Park / Acworth Beach. 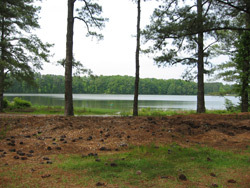 South Shore Park is a skinny strip of land that is situated along a straight section of Lake Acworth shoreline. The pull in park road ends at a small circular turnaround, where this is also a very small beach. There is no roped off swimming area. 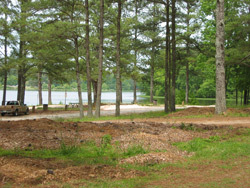 The park's main attraction is its shoreline fishing access to Lake Acworth. There are many short paths that connect the park road to the edge of the lake. Looking out over Lake Acworth from the shore of South Shore Park.